Zoulah has been baking again; she just can't get enough of Halloween baking. It's not like she can bake Halloween goodies during the Christmas or Valentine's Day season -- this is her time and she's making the most of it! 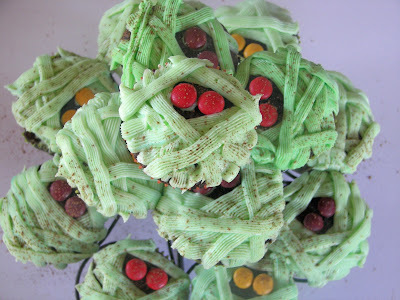 Today she made some Moldy Mummy cupcakes. She took some moldy mummy cupcakes over to our new neighbors; the Red Couchers can't eat all her treats, and Zoulah is just a welcoming kind of witch. Zoulah is a big fan of the Women's Day magazine; these, and other fun Halloween cupcakes, were on the cover several years ago. Decorator Tip -- Zoulah used a #47 Wilton tip. Bake cupcakes and cool. Make buttercream frosting and tint lightly with green coloring. Load into decorator bag and attach tip. 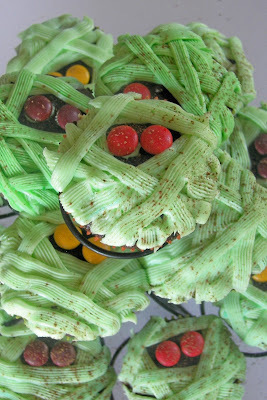 Dab a bit of frosting on two M and M's and attach to cupcake as eyes. 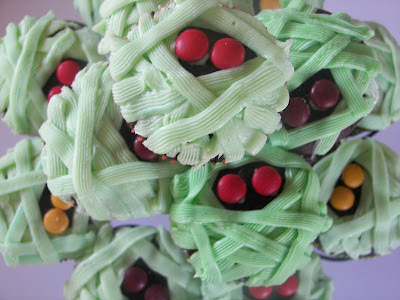 Then begin to "wrap" cupcakes in frosting, laying frosting in mostly diagonally strips -- leave opening around eyes. This was a fun Saturday project; the Red Couch girls helped frost the mummies. Cupcakes without the mold spots. They look like they need some mold spots. To get the "spotty moldy effect," put a small amount of cocoa in a small-opening sieve (strainer) and shake lightly over cupcakes. My youngest took a bite out of it and Zoulah thought it looked like a monster. Thanks Zoulah! Every year I take some ghoulish treats into the office - these will be great for this year's treats - a nice change from bloody fingers and hairy eyeballs! Zoulah! You have done it again, in spite of your warty nose. :D What spendid moldy cupcakes. There is not a goblin alive that would not welcome one of these treats. Wow. Looks delicious. Mold and all!! Good work Zoulah! Zoulah, you made some perfect cupcakes. You need to come up Monday for our Scary Halloween Dinner at 6:30. These cupcakes would be perfect. They are really cute and I agree, they needed a little mold and aging to make them just right. Love that Zoulah added the mold:) You have some lucky new neighbors! Wow, I love these cakes! Very goulish, hahaha. Another great treat. You are so creative and energetic. I am getting tired just reading your blog. How do you do it? I'm so impressed. These are darling...love the mold addition. It is the perfect touch!! These are fantastic! My kids would LOVE these!!! These are just priceless!! I love the color and the look of them! Way to go, girly!! So creative! 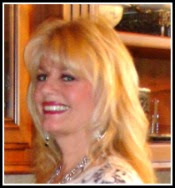 I'm so excited to be your newest follower of your delightful blog and I'd love to have you as a friend at Frou Frou Decor! 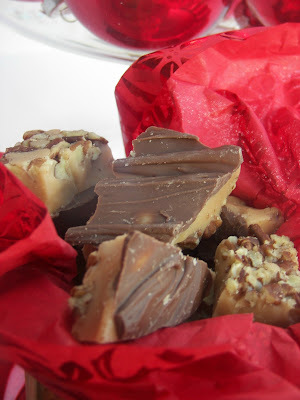 Be sure to link up your sweet creations at my weekly link party, every Friday! Hope to see you there! These are so cute and not soooo... complicated that they can't be done. Oh yum! These would be so great for school, too bad so many kids in my daughters class have allergies! About the screen, no I didn't paint it, but I have done painting on screens before. It is very easy, this just happened to be easier because it was at a garage sale! Go and give it a try! My boys would love these. Now I have a baking "must do" for the weekend. Love them! We featured you on our blog again :) Come grab a button! these are adorable...i have made mummy cupcakes in the past...but the brilliant move of making them moldy...that zoulah..she is real genius! Thanks so much for adding them to Cupcake Tuesday! Those are so cute and fun! I love how you made them look old by sprinkling them with cocoa! Unreal,have never seen anything like them!What a great Halloween Treat! I saw those cupcakes in Woman's Day too but never tried them. I really like how yours turned out! 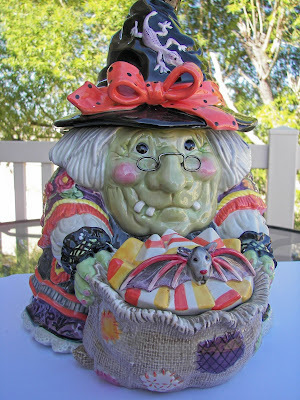 Thanks for joining my Halloween Link Party! Adorable! Can I say that about a rotting mummy? These are instantly recognizable as mummies and they don't look too terribly tricky to do. Always a plus in my book! 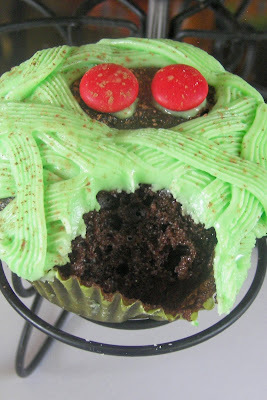 Great Halloween decor and your cup cakes are awesome! Your really in the "spirit" of the season! These are soooo cute! I wish I'd had this recipe when I was teaching preschool. With a little help,even the munchkins could try their hand at decorating. These are so cute! I bet my daughters would love to make these. Very cute. I like the moldy effect!